I find myself in weird positions sometimes. Physically, I mean. But I don’t think this is unique to me, or my profession as an equine veterinarian. All horse owners can appreciate that awkward, light-footed crouch needed to peer up at a hidden wound between the front legs of skittish gelding. But I do think that I’m in these odd positions at a higher frequency than most horse owners. I mean, hopefully you aren’t scrunched in a ball looking at wounds in weird places all day long. Me? Sorta my job. Every once in a while, if the barn is quiet and I turn a certain way, I hear my shoulders crack and hips pop. Occasionally a client will go, “Oh! Was that you?” I am reminded that regularly palpating mares takes its toll on the human body (a common chronic use injury for large animal vets is rotator cuff injury) and I sometimes think that perhaps one should design a few yoga positions aimed at the equine practitioner. I have a few ideas myself. For starters, a very basic position, in which the practitioner is standing straight, with one arm long at the side and the other arm at a right angle to the body, could be called Lucky Mare, facetiously mimicking the stance we take as we palpate. 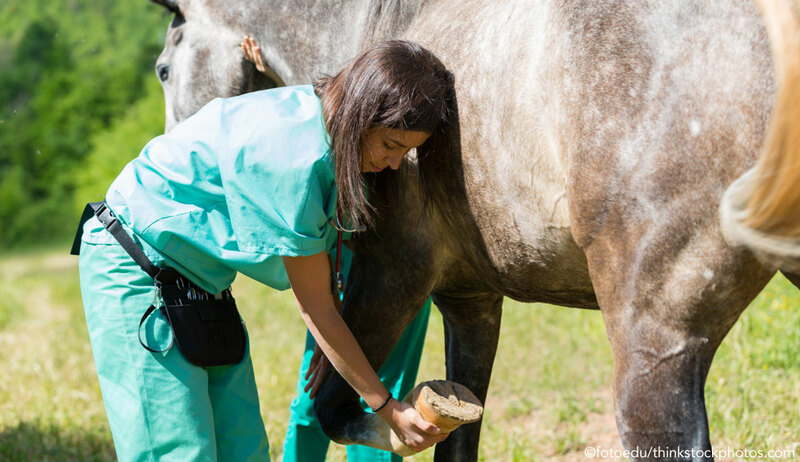 During this position, the practitioner would close her eyes and her mouth, taking only deep breaths through the nose, focusing on the feel of ovaries and an equine uterus. For more advanced practitioners, this pose can be made more challenging if you grasp an ultrasound probe in the fingers of the raised arm. Here, slowly rotate the probe while maintaining a steady grip. Arm getting tired? Good! Now breathe! For the most dedicated of equine-vet-yogis (or those who work at large broodmare farms), do this position thirty times in a row. OK, here’s another one. I like to call this: Leaning Clydesdale. In this position, you should bend at the waist at about a seventy-degree angle, with arms curled as if you were holding something very heavy. The back should be rounded, and the legs strong, bent, and held shoulder’s width apart. Imagine a hoof—a very large hoof, like, dinner plate-sized—in your lap, as you examine the sole for a tiny dark spot indicating the start of an abscess. 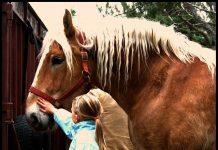 Then visualize this hoof belonging to a two-thousand-pound draft horse that has decided that if you insist on holding his foot, then he can use you in place of his foot and therefore lean one quarter of his weight on your back. Hold this position for ten minutes. Don’t forget to breathe. The last yoga-for-vets position is called Stitching the Wound and it looks like this: in a deep squat, hold both arms in the air, biceps pressed against your ears. Move your wrists in tiny circles while pretending to hold something delicate between your fingers. Tilt your head up so that your eyes follow the movements of your hands but be careful not to put stress on your neck as you hold the position for five, ten, fifteen minutes. Also be careful to not stress your knees. And your back. And your shoulders. Keep your core strong. And consider wearing a sweatband to keep the sweat from your eyes. And, as always, remember to breathe. Will regular practice of these positions help decrease those cracks and pops I sometimes hear? Maybe. Maybe not. I’m certainly no equine-vet-yogi…not yet anyway. Practice makes perfect, right?